The first item woke me up to the virtues of the lotus plant that is not used significantly yet in the West. What peaks my interest is that we have underutilized wetlands in temperate lands and elsewhere that need to be optimized. Elder berries and cattails only go so far and do nothing in a few inches of water. Thus a lotus culture able to handle higher latitude conditions is an attractive proposition. We even have beavers to build the paddies for us. It may even help feed the beavers. My point is that any small to medium water way attractive to a beaver can be used to promote a lotus culture. The productivity may even match most crops even if one only takes the seeds. Even better there exists a mature market for all the possible products listed below. Could a Flower Outsmart Your Body’s Fat Cells? But I was still surprised to see what my new friends in Bali, Lelir and Westi, had made us for dinner. I expected them to eat like birds, but every single dish on the table was rich, creamy or sweet. My first bite of bubuh injun had me wondering how in the world the Balinese stay so slim. I’d just flown halfway around the world to see for myself if what I’d been reading about could possibly be true: Could they eat as much rich food as they want throughout Bali and still stay naturally thin? I may have found the answer hiding in Lelir and Westi’s everyday routines. It’s a fat-melting flower that’s one of Bali’s best-kept secrets. And the truth was even better than I imagined. You see, Bali is a place that doesn’t give up its secrets easily. After centuries of being invaded and conquered by hostile nations, the Balinese have become fiercely protective of their culture. That might be why so few people know the full story behind one of their most celebrated treasures. They call it sacred lotus (Nelumbo nucifera). 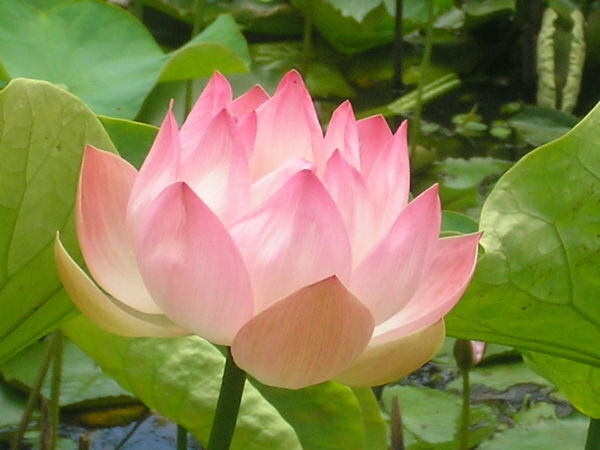 I saw its large, pink petals blooming above the surface of freshwater ponds. A few times I saw peddlers selling its unusual fruit, which grows right in the center of the flower and looks like the spout of a watering can. But most of the time I saw it carved into intricate stone statues outside of Hindu temples. Westi told me that the sacred lotus represents divine beauty and purity, and has symbolic importance in the Hindu religion, which most Balinese practice. Although it seemed to be everywhere I went on the island, very few outsiders know what this beautiful flower can really do. The sacred lotus may hold the key to helping you achieve accelerated fat reduction. Sacred lotus seems to specifically target fatty tissue. It helped keep the animals from gaining more weight – and many even dropped weight. These preliminary results are very exciting and I anticipate that human clinical trials will show a similar benefit. The results look very promising in my opinion. The distinctive dried seed heads, which resemble the spouts of watering cansphoto, are widely sold throughout the world for decorative purposes and for dried flower arranging. The flowers, seeds, young leaves, and "roots" (rhizomes) are all edible. In Asia, the petals are sometimes used for garnish, while the large leaves are used as a wrap for food, not frequently eaten (for example, as a wrapper for zongzi). In Korea, the leaves and petals are used as a tisane.Yeonkkotcha (연꽃차) is made with dried petals of white lotus and yeonipcha (연잎차) is made with the leaves. Young lotus stems are used as a salad ingredient in Vietnamese cuisine. The rhizome (called ǒu (藕) in pinyin Chinese, ngau in Cantonese, bhe in Hindi, renkon (レンコン, 蓮根 inJapanese), yeongeun (연근 in Korean) is used as a vegetable in soups, deep-fried, stir-fried, and braised dishes and the roots are also used in traditional Asian herbal medicine. Petals, leaves, and rhizome can also all be eaten raw, but there is a risk of parasite transmission (e.g., Fasciolopsis buski): it is therefore recommended that they be cooked before eating. Lotus rootlets are often pickled with rice vinegar, sugar, chili and/or garlic. It has a crunchy texture with sweet-tangy flavours. In Asian cuisine, it is popular with salad, prawns, sesame oil and/or coriander leaves. Lotus roots have been found to be rich in dietary fiber, vitamin C, potassium, thiamin,riboflavin, vitamin B6, phosphorus, copper, and manganese, while very low in saturated fat. The stamens can be dried and made into a fragrant herbal tea called liánhuā cha (蓮花茶) in Chinese, or (particularly in Vietnam) used to impart a scent to tea leaves. The lotus seeds or nuts (called liánzĭ, 蓮子; or xian liánzĭ, 鲜莲子, in Chinese) are quite versatile, and can be eaten raw or dried and popped like popcorn, phool makhana. They can also be boiled until soft and made into a paste, or boiled with dried longans and rock sugar to make a tong sui (sweet soup). Combined with sugar, lotus seed paste becomes one of the most common ingredients used in pastries such as mooncakes, daifuku, and rice flour pudding. In Vietnam, the bitter tasting germs of the lotus seeds are also made into a tisane (trà tim sen). A unique fabric from the lotus plant fibers is produced only at Inle lake, Union of Myanmar and is used for weaving special robes for Buddha images called kya thingahn (lotus robe).